For better or worse, tech has always been a field packed with exotic terminology and bizarre acronyms. The sheer volume of them can turn some simple shopping research into a chaotic whirlwind of terms and data that leaves you more confused that when you started. Worry not, we're here to help. 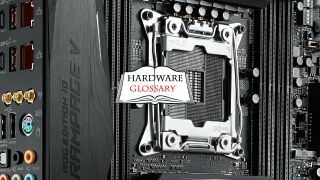 We've broken out all our hardware categories below and explained some of the most common (and a few of the more uncommon) terms for each, so you have one simple master list you can reference anytime your browsing our best of lists or checking out a review of some of the hottest new tech. And if you come across a term that we haven't delved into below, be sure to reach out in the comments and we'll be happy to add it. Audio remains one of the most underrated elements of the gaming experience, but it's one of the most crucial for immersion. Any audiophile can tell you that recording and transmitting sound is a complicated business, from the coil, driver, and diaphragm that make up the internals of a speaker or headset to software terms like bit depth and resolution that determine the quality of a recording. We've sorted out some of the terms that appear most frequently in gaming mic and headset coverage and broken them out for you below, to take some the mystery out of the wonderful world of sound. Amplitude: The magnitude of a signal, the maximum amount of vibration, measured from an equilibrium. Attenuation: The reduction of a signal. Bit depth: The number of bits (the amount of data storage) used to describe each audio sample in a sample rate. Bit rate: The number of bits transmitted per second. Cardioid mic: A directional mic that picks up sound from the front but rejects input from the sides and rear. Coloration: Resonances in the material of an output device like a speaker that have an unwanted effect on sound. Diaphragm/cone: In a speaker, the thin, flexible membrane attached to a voice coil that produces sound when the coil’s movement causes it to vibrate. Driver: A general term for the conductive material that moves in response to a magnetic field when current is passed through it, driving the diaphragm to which it is attached to vibrate and produce sound. In traditional speakers it’s usually a coil of wire, whereas in planar magnetic speakers/headphones it’s a serpentine pattern of thin, flat conductive wires. Drivers are, in the most basic terms, the way that electronic signals are converted to sound. Dynamic range: The total range of possible volumes in an instrument or piece of equipment. Frequency: A vibration that the human ear can perceive as sound. Frequency response: A measure of the output spectrum of a system or device in response to a stimulus. Gain: The amplification factor of an output signal compared to an input signal; an amp with a gain of two will output twice twice the value of an input signal . Harmonic distortion: Generally undesirable presence in an output of harmonics not present in the input, added by the speaker or electrical circuits. Imaging: A device’s ability to place sound in space with a sense of size, location, depth, etc. Modal break-up: Tendency at high frequencies for a diaphragm to flex rather than move as a whole, leading to non-harmonic distortions. Noise floor: Measure of all the native noise in a system or recording device, whether it’s circuit noise on a device or background noise in a room. Polar pattern: A mic’s pickup pattern that determines which sides of the mic it accepts inputs from. Resolution: The combination of sample rate and bit depth and a general indicator of the fidelity of a recording. Voice coil: Part of a traditional driver in speakers, a coil of wire attached to the diaphragm that sits in a magnetic field and vibrates when current is passed through it, transforming it into an electromagnet. The Central Processing Unit is the brain at the heart of your PC or console, the powerful chip that coordinates just about anything that happens inside your favorite gaming hardware. From the cores that process commands to the various sorts of heat sinks that keep everything running cooly and efficiently, CPUs are complicated pieces of technology with their own deep lexicon, so we laid out some of the more common terms below. Caching: A small segment of high speed memory dedicated to storing and executing frequently used commands/instructions to speed up software execution. CPUs contain caches designed Level 1, 2, and 3, with L1 being the fastest and slowest and L3 being the slowest and largest. Core: A processing unit that handles threads of commands. Modern CPUs can contain anywhere from two to 70+ cores (in supercomputers), though CPUs housed in most consumer machines will generally carry between four and eight. Clock speed: The speed at which a CPU can execute instructions, measured in hertz. A processor with a 3.7 GHz clock speed can process 3.7 thousand million instructions a second. Clock speed is one of the most important factors for determining performance in games and workload functions. Heat sink: A cooling solution for PCs that either utilize fans or liquid cooling (active) or aluminum radiators (passive) that rely on convection to regulate the temperature of a component. Hyper-threading: Intel developed solution that allows a processor two handle two sets of instructions simultaneously. MT/s or GT/s: Megatransfers and gigatransfers per second, the number of data transfer operations a CPU can complete in one second. Socket type: LGA (Land Grid Array), PGA (Pin Grid Array), or BGA (Ball Grid Array), the way a CPU interfaces with the socket on a motherboard. LGA is Intel's socket in which the pins are native to the socket, whereas in AMD's solution, PGA, the pins are on the processor itself and fit into slots on the socket. A BGA socket is one in which the processor is permanently soldered to the motherboard. TDP: Thermal design power, the maximum amount of heat a system or chip can produce that the attendant cooling system is designed to deal with under workload. This term can apply to PCs as a whole, GPUs, CPUs, or nearly any other performance component that generates heat, and is in large part an indicator of how much power a part draws. Turbo boost: Intel technology that allows processors to run at higher clock speeds under demanding loads. You'd be hard pressed to find marketing for a category that loves its pseudo-techy buzzwords more than displays, especially televisions. From that old saw contrast ratio, the differential between the brightest whites and darkest blacks, to HDR, the color and lighting tech that's glommed onto the 4K hype train, the people writing marketing copy for displays have long been selling them based on the latest tech wrinkle/gimmick. We define some of the most used terms to help you separate the truth from the hype. Color accuracy: How closely a displayed color is able to match its real world counterpart. Contrast ratio: How bright and dark a display can get at maximum settings. Frame rate/FPS: Frames per second, the number of images displayed in a given second. In gaming, this is largely dependent on the power of the rendering hardware and the complexity of the graphics being rendered. Low frame rate will cause a game to appear to be stuttering or even temporarily frozen in extreme cases. HDR: High Dynamic Range, which is generally used in a way that encompasses WCG, a display technology that allows for a broader range of contrast and color, enabling brighter highlights, deeper blacks, and richer color, providing overall superior picture quality. Available on the latest hardware refresh of this generation's consoles, the PlayStation Pro and Xbox One X, and high end GPUs. HLG: Hybrid Log Gamma, an HDR format designed to support broadcast cable, satellite, and live television. IPS: In-plane Switching, a technique for LCDs that provides the best viewing angles and color amongst competitive LCD tech (VA and TN) by switching the orientation of the liquid crystals in a panel. LCD: Liquid crystal display, a flat panel display technology that uses liquid crystals to block light from a backlight, rather than emit it. LED: Light-emitting Diode, solid state technology that produces light by pushing electrons through a semiconductor; because they’re too large to light pixels individually, they’re only suitable for backlighting LCDs. They tend to produce better brightness than newer OLED panels at a lower price, but an overall inferior picture quality. Local dimming: A technique of using backlight to dim or light zones of a panel to enhance contrast and picture quality. Full-array dimming is the most robust, with individual zones across the entire panel, whereas edge-lit dimming features bigger zones with less individual differentiation. Mura: Irregular illumination or color from pixel to pixel on LCDs, also called clouding. OLED: Organic LED, a flexible, thin LED technology that uses organic material that lights up when electricity is pulsed through it. Because OLED allows for much smaller individual lighting zones, it’s not necessary to use it only as a backlight for LCD displays. OLED’s generally produce better viewing angles, black levels, and overall picture quality than LEDs, though generally at a higher price point. QD: Quantum Dot, an LCD technology that uses a sheet or tube of nano-crystals to improve color gamut and saturation, nearly to the level of OLED displays (often with better brightness but without the same contrast levels or super-wide viewing angles). QLED: Quantum Dot LED, Samsung's Quantum Dot powered panels. Refresh rate: Measured in hertz, refresh rate is a measure of how many times the image on a display is updated. A refresh rate of 60 Hz is equivalent to 60 frames per second. Conflicts between the number of frames being outputted by hardware like a console or PC and the refresh rate of your display can cause visual artifacting and tearing. Higher refresh rate panels are crucial for a smooth gaming experience. Resolution: The number of pixels a display is capable of displaying, written as width by height. A 1920 x 1080 display renders 1920 pixels across and 1080 pixels vertically. Displays are sometimes shortened to just quote the height, in which case the above resolution is called 1080p (also commonly referred to as high definition) or 2160p (3840 x 2160 pixels or 4096 x 2160 pixels, commonly referred to as 4k because it's four times the resolution of 1080p). Resolution is the single most important factor in how crisp and clear games look on a display. Tearing: Tearing is the appearance of an image being severed, with one frame appearing on one side of the tear and another on the opposite side, and is most often the result of hardware sending more frames to a display than the refresh rate of the display is designed to handle. V-sync corrects this issue by limiting the number of frames the hardware outputs to match the refresh rate of a display. TN: Twisted Nematic, the cheapest and fastest LCD display technique which traps nematic liquid crystal between two planes of polarized glass. UHD: Ultra-high-definition, the term used to describe 4K and 8K resolutions. VA: Vertical Alignment, an LCD panel technology with the best image depth and highest contrast amongst other competitive LCD techniques (TN and IPS) but slowest response time. WCG: Wide Color Gamut, a technique that expands the number of colors and shades available to displays, from HDTVs 16.4 million colors to over one billion. The sexiest component of any PC build, GPUs are also one of the most complicated, especially with how manufacturers keep packing in specialized bits designed to exclusively handle a single function. The latest round of Nvidia hardware is an excellent example, with ray tracing (the rendering technique to make lighting more realistic and detailed) and DLSS (an anti-aliasing technique powered by machine learning) making headlines as the future of gaming. Stay abreast of the trends with our breakdown of some key terms. AIB/AIC: Add-in board or add-in card (AMD and Nvidia terms, respectively), a general term for a graphics card or any other card you put into an motherboard expansion slot; often used to refer to the 3rd party companies that produce graphics cards based on Nvidia and AMD's original hardware, like Asus, EVGA, Gigabyte, etc. In cases where a third party is creating a version of a first party's card, the first party hardware is called the reference card, and the third party's a custom (or semi-custom) or partner card. First party AMD cards are sometimes called MBAs or BBAs (made/built by AMD). CUDA: Compute Unified Device Architecture, a specialized programming language from Nvidia that accelerates GPU computation processes; CUDA cores are parallel processors that handle GPU computation on Nvidia’s graphics cards, and are all identical - as many as are needed are assigned to a task. DLSS: Deep Learning Super Sampling, an image rendering/reconstruction technique that renders an image at sub-native resolution and then uses AI inferencing to upscale and improve the image. DXR: DirectX Raytracing, Microsoft’s addition to DirectX 12 that enables ray tracing in DirectX reliant software. GPU: Graphics Processing Unit, the chip on a graphics card or motherboard that handles the heavy lifting of graphics processing. GPU is often used interchangeable with graphics card to describe a discrete video card. Overclocking: Improving a PC component’s performance by pushing it beyond the manufacturer’s default settings. On graphics cards, this is done by increasing the card’s clock speeds and voltage, generally in small increments until the card starts to act irregularly. Ray tracing: A rendering take that traces the path of light as pixels and computes how light would interact with virtual objects. The flagship capability of Nvidia’s RTX 20-series of graphics cards, ray tracing makes high fidelity representations of reflections, refractions, and light scattering possible. Nvidia is touting ray tracing as the future of gaming, and when properly applied it can be a very striking technique. RT Cores: Nvidia’s proprietary ray tracing cores that enable the technique on its RTX cards. SLI: Scalable Link Interface, a method of linking multiple video cards to create a single output and increase performance. Stream Processors: AMD’s GPU computation cores, which are grouped in blocks of six. Unlike CUDA cores, stream processors are not all identical - four of each six are them same while the fifth and six handle specialized tasks, like floating point calculations. Tensor core: Nvidia’s proprietary cores dedicated to artificial intelligence, deep learning, and AI applications. VRAM: Video RAM, the memory onboard a graphics card that acts as a buffer between the CPU and the display. With mechanical keyboards becoming ever more ubiquitous in PC gaming (and even starting to infiltrate the console space), it's important to understand what separates them from traditional, older keyboard tech. The primary difference is the switches, the construction housed beneath the keycaps that determines how every key press actuates, and we understand if you have some trouble differentiating one from another in the rainbow of color-coded designations in the world of the mechanical switch. We explain all of the most common switches below, and break down some of the other crucial terms and tech that go into creating the modern deck. Cherry MX Black: Quiet, linear, heavy switch (60g actuation force). Cherry MX Blue: Loud, tactile, heavy switch (50g actuation force). Cherry Brown: Quiet, tactile, medium switch (45g actuation force). Cherry Clear: Quiet, tactile, medium switch (65g actuation force). Similar to browns with a stronger tactile response. Cherry MX Green: Loud, tactile, heavy switch (70g actuation force). Almost identical to Cherry MX Blues but with a harder spring. Cherry MX Red: Quiet, linear, light switch (45g actuation force). Cherry MX RGB: Available in Blue, Brown, Red, and Black, Cherry's RGB switch replaces the stopgap 3mm LED solution the company was leaning on for colored lighting with a proprietary light conductance option that provides more uniform, even lighting. Cherry Speed: Quiet, linear, light switch (45g actuation force). Clicky: A switch whose actuation is accompanied by an audible click, somewhat like an analog typewriter. Contact leaves: Metal contacts that register a keystroke when they strike each other. Debounce: A technique that ensures only one signal is registered every time two metal contacts touch. GX Blue: Logitech's loud, tactile, heavy switch. Housing: The case that surrounds all the other components of the switch. Hysteresis: The misalignment of the reset and actuation point, meaning a key needs to be rebound higher than the actuation point to be pushed and actuated again. Kailh Black: Quiet, linear, light switch (60g actuation force). Kailh Blue: Loud, tactile, heavy switch (60g actuation force). Kailh Brown: Quiet, tactile, medium switch (55g actuation force). Kailh Red: Quiet, linear, light switch (50g actuation force). Keycap: The plastic top of the switch with the input printed on it. Linear: A switch that moves straight up and down and delivers a smooth, consistent keystroke generally without noise or tactile feedback. Mechanical keyboard: A keyboard whose keys are all individuated and don't share a single membrane sheath. Mechanical keyboards tend to be more precise and can be customized to a much greater degree than membrane boards, whether you want a silky smooth, silent typing experience or clicky, tactile feedback. Membrane keyboard: A keyboard whose keys all share a single a membrane sheath; when a key is pushed, a rubber dome is depressed and pushes against the sheath, actuating when the key is pushed all the way down. Plate/PCB mounted: Denotes whether switches are mounted directly to a printed circuit board (PCB) or to a plate laid atop the PCB. Razer Mecha-membrane: Quiet, tactile, medium switch that combines the softness of a membrane rubber dome with the tactile click of a mechanical switch. Razer Opto-mechanical: Loud, tactile, medium switch (45g actuation force) that blends standard mechanical design with an optical sensor that triggers actuation when it's struck by light beaming through a hole in the stem from the other side of the switch. Razer Orange: Quiet, tactile, medium switch (45g actuation force). Razer Yellow: Quiet, linear, light switch (45g actuation force). Razer's quietest, fastest switch. Rollover: The maximum number of keys that can be pressed simultaneously and still be detected as discrete inputs. Romer-G Linear: Logitech's quiet, linear, light switch (45g actuation force). Romer-G Tactile: Logitech's quiet, slightly tactile, light switch (45g actuation force). Slider: The element that pushes against the spring and interrupts contact between the metal leaves on the side of the switch. Spring: Coil around the stem that resets the switch to its resting position after it's been pushed. SteelSeries QS1: Quiet, linear, light switch (45g actuation force). Stem: The component on which the keycap is mounted, which varies significantly by switch. Tactile: A switch that delivers a bump of feedback in the middle of travel right near the actuation point. Tenkeyless: A keyboard without a numeric keypad. Topre: Quiet, tactile, light-to-medium switch (30-55g actuation force). For such a tiny, unassuming peripheral, mice are surprisingly complicated pieces of kit. Powered by optical or laser sensors, the tech that scans a surface and reports back to your PC when you shift your mouse around, with precision measured in counts per inch and maximum speed in inches per second, modern mice are the product of decades of iteration and development. Acceleration: A setting that means a mouse moving quickly will move a cursor further than a mouse moving slowly over the same distance. Angle snapping: Prediction that smooths out movements so that, for instance, a horizontal line will be perfectly straight when drawn with your mouse at the sacrifice of precise tracking. CPI/DPI: Counts per inch, often erroneously referred to as dots per inch, the number of pixels your cursor will move per every inch the mouse is physically moved. One of the most important factors in a gaming mouse, CPI can be the difference between laser accurate headsets and randomly spraying rounds. IPS: Inches per second, the speed a mouse can move and maintain accurate tracking. Jitter: Inaccuracy of a sensor reading the surface beneath the mouse, causing the cursor to jump or move erratically, often as a result of dust on the sensor or irregularities on the mouse surface. Laser sensor: Capable of penetrating deeper into a surface, laser sensors can be used on glossy surfaces or glass, but are more prone to inaccuracy on other materials than optical sensors. Lift off distance: The height a mouse has to be lifted off a surface before the sensor stops tracking; a lower setting is preferable for low CPI players who pick up their mouse frequently to reset it’s position. Optical sensor: An infrared LED based sensor that doesn’t permeate a surface very deeply and is generally more accurate than laser but works best on non-glossy surfaces. Perfect control rate: The speed a mouse can move while still tracking accurately, also called malfunction rate. Polling rate: The number of times that a mouse reports its position, measured in hertz; a 1000Hz polling rate means a mouse reports once per millisecond. Random Access Memory plays a critical role in PC operation, storing data in much faster memory to allow for speedy access. It's also a category with some of the most esoteric terminology in the PC universe, from memory timings that determine how often a memory module is accessed to Extreme Memory Profiles that are crucial to enthusiasts looking for the easiest ways to overclock their hardware. CL/CAS latency: Column Access Strobe Latency, delay between the memory controller requesting data and it being available; more technically, the delay between the memory controller telling a module to access a memory column and the data being available on the module's output pins, listed as the first number in a RAM module's timings. DDR: Double Data Rate, a type of RAM that is capable of two data transfers per clock cycle. Iterations are labeled with a following number, as in DDR2, DDR3, and DDR4. ECC memory: Error-correcting Code Memory, RAM that detects and automatically corrects data errors, used mostly for sensitive data handling like scientific calculations or financial computing. RAM: Random Access Memory, PC memory in which any byte of data can be accessed at any time without requiring previous data to be accessed. SO-DIMM: Smaller form factor DIMM for laptops. SPD: Serial Presence Detect, hardware built into RAM that tells the PC what memory is present and what timings to use to access it. Upgrading/mixing RAM: Mixing different RAM packages is generally inadvisable, but can be done. To mix RAM with different timings or voltage, the DIMMs need to be tweaked in BIOS. RAM with different transfer rates will generally see the faster module automatically underclocked to match the slower RAMs speed. XMP: Extreme Memory Profile, a profile that automatically instructs the BIOS at boot to operate RAM at overclocked speed, adjusting timings, frequency, and voltage simultaneously.